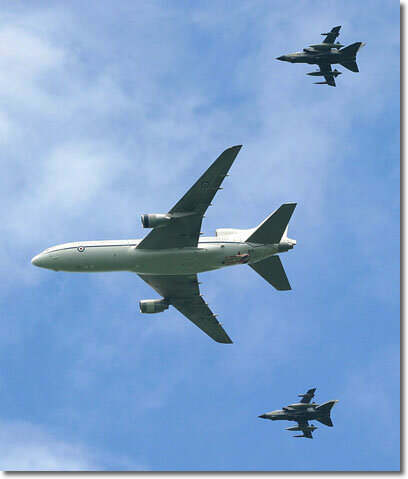 At 10,000 feet over Norfolk we get the first glimpse of our three Tornado GR.4 escorts from IX (B) Sqn. 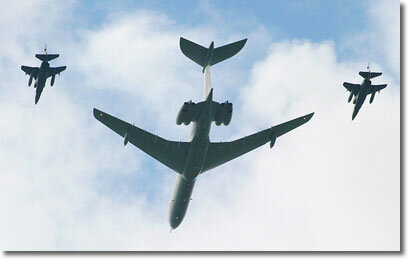 With the airspare staying with the Tristar until the final run-in to London. Arriving over Southwold at altitude with the harbour visible through the scattered cloud. The Southwold docks provide the backdrop as 'FAGIN COMBINE' flies behind 'WINDSOR LEAD', the C-17A in the holding pattern awaiting the various elements to arrive and join up in trail. EOS-10D 17-40mm IX (B) Sqn. 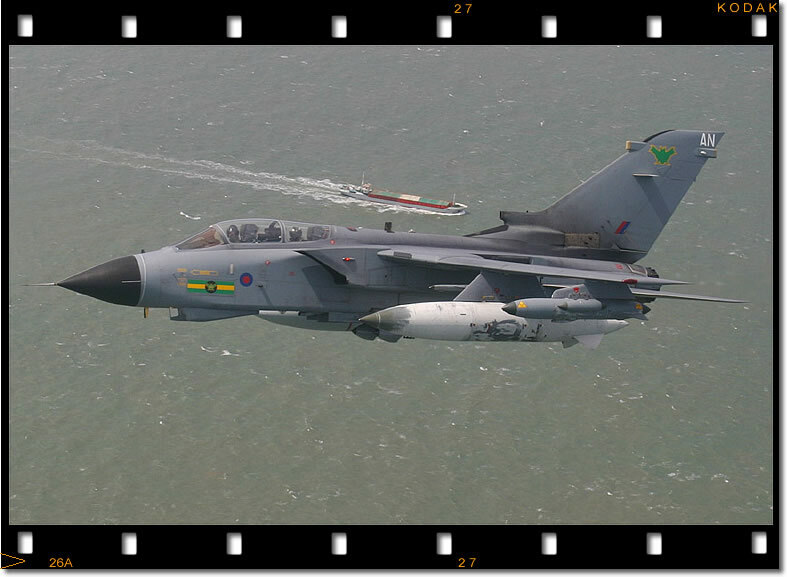 Tornado GR.4 ZA613 (AN) off the Suffolk coast being watched by a passing freighter. Just visible over the nose of the Tornado are the VC-10 and Jaguar's of 'MADRAS COMBINE' on the opposite side of the Southwold holding pattern. Crossing central London at 1pm with Piccadilly Circus and Regent Street just visible at the bottom of the image, at this point the formation is over the Mall, happy birthday Ma'am! Having crossed over the Royal family on the Palace balcony, the formation passes Hyde park with the Serpentine lake below, not many boats out today! 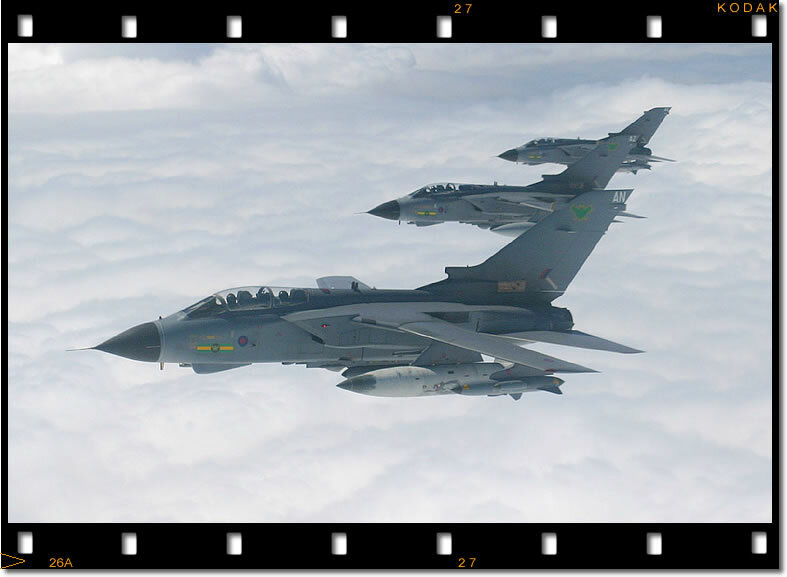 EOS-10D 17-40mm Following the flypast the two IX (B) Sqn. 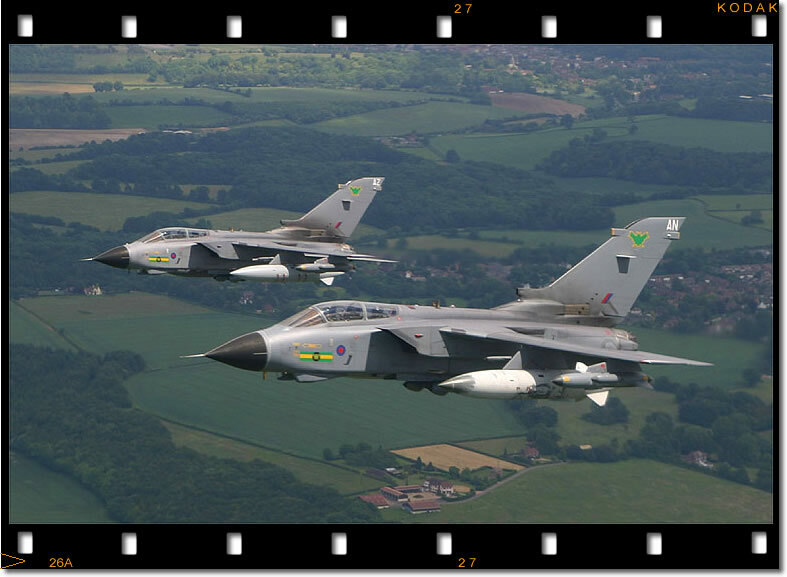 Tornado GR.4s join up off the starboard wing before breaking away to return to RAF Marham. Mission completed. 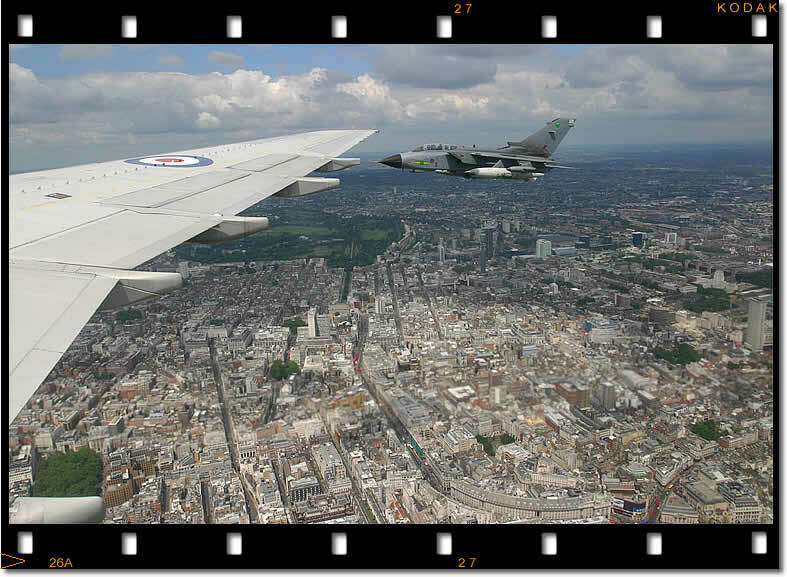 Saturday June 12 – I’m driving through West London at 07:30 en-route to RAF Brize Norton - at 13:00 I would see these same streets again from a very different and unique perspective, at 1500ft and at 320 mph in a Tristar K.1 of 216 Sqn, one of three aircraft from Brize Norton’s transport wing to participate in the 2004 Queen’s Birthday Flypast. Preparations for the flypast take months of planning, selecting aircrew and getting CAA approval to fly at 1500ft through the crowded London TMA. 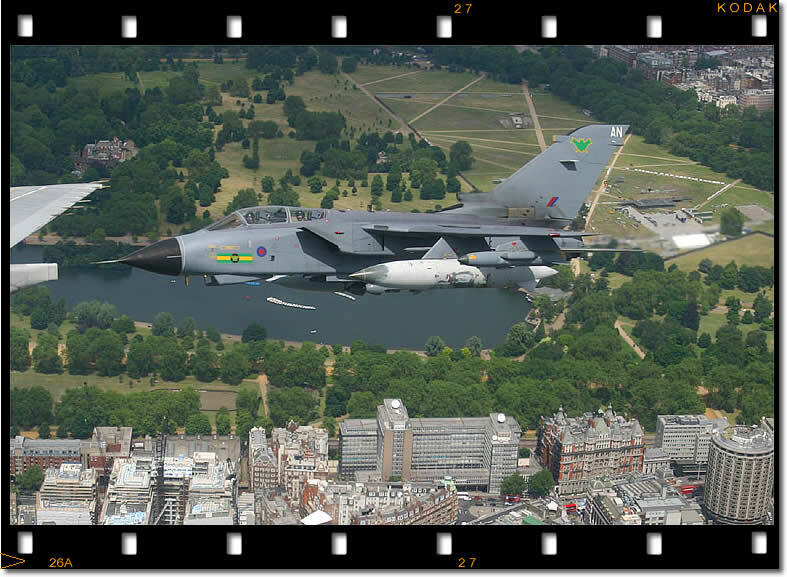 This culminated with a full dress rehearsal on June 9 with RAF Marham replacing Buckingham Palace to enable the crews to refine their formation flying skills and perfect their timing. 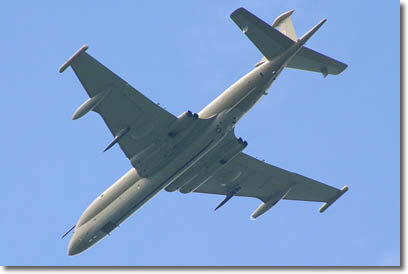 Led by a C-17A Globemaster III of 99 Sqn, the eleven aircraft performing the flypast consisted of eight types of RAF front line hardware in five elements seperated by two nautical miles per element for a total distance of eight nautical miles (see table). 'FAGIN COMBINE' casts its shadow over the green fields of Suffolk en-route to London. Arriving at Brize Norton’s passenger terminal I joined a large group of RAF families who were being given a rare opportunity to witness RAF operations at first hand. With around eighty passengers for the Tristar and a further group on the 10 Sqn VC-10 we were given our boarding cards and then bussed out to our aircraft, ZD949. Once aboard we were welcomed with typical RAF humour by our Co-pilot, Flt Lt Smith, who announced: “Welcome aboard FAGIN flight, non-stop service to Basrah”. 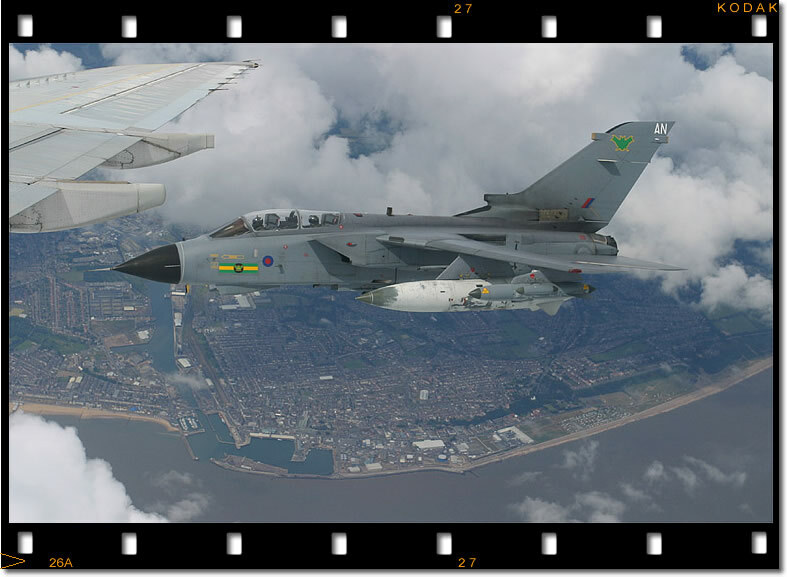 Once airborne the route took us initially north then east climbing to ten thousand feet to rendezvous with three Tornado GR.4s of IX (B) Squadron over RAF Marham, Norfolk. With our ‘Chicks’ in tow and the call sign changed to ‘FAGIN COMBINE’ we descended towards our holding point, the coastal town of Southwold, Suffolk. At this point we would enter a racetrack pattern while the remaining elements of the formation would join up under the watchful eyes of the two Hawk T.1A ‘Whipper In’s’. Normally this is accomplished at around 3000ft AGL but a cloud deck at 2000ft and scattered shower clouds meant the elements would have to descend as low as 1100ft to remain in the clear. 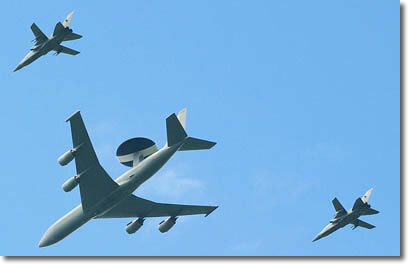 The cloud deck was at the minimum height required to safely get the formations compiled, any lower and the flypast would have likely been reduced to just one or two elements. 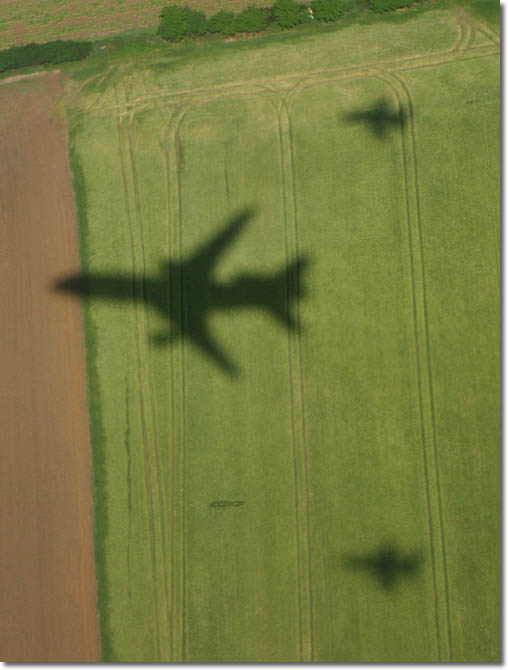 The weather, combined with wake turbulence from the lead C-17A resulted in the seat-belt signs remaining on and a few passengers beginning to feel slightly unwell after forty minutes of formation flying! Low-level formation flying is the stock-in-trade of front-line RAF pilots and although they make it look easy I’m sure it is anything but! The announcement came from the flight deck that we were starting the run into London at 12:45 and as the weather over London improved the formation set up at the correct altitude of 1500ft at 280 knots (320 mph) and soon we were crossing Ipswich, Colchester and Chelmsford, then East London. Cameras at the ready we crossed the Mall then banked right to avoid closing too close to Heathrow and all too soon were climbing over Hertfordshire with both Tornado’s now on our right wing for a few more minutes before they drifted away and resumed their call signs of ROCKET 1/2 for their return to Marham. 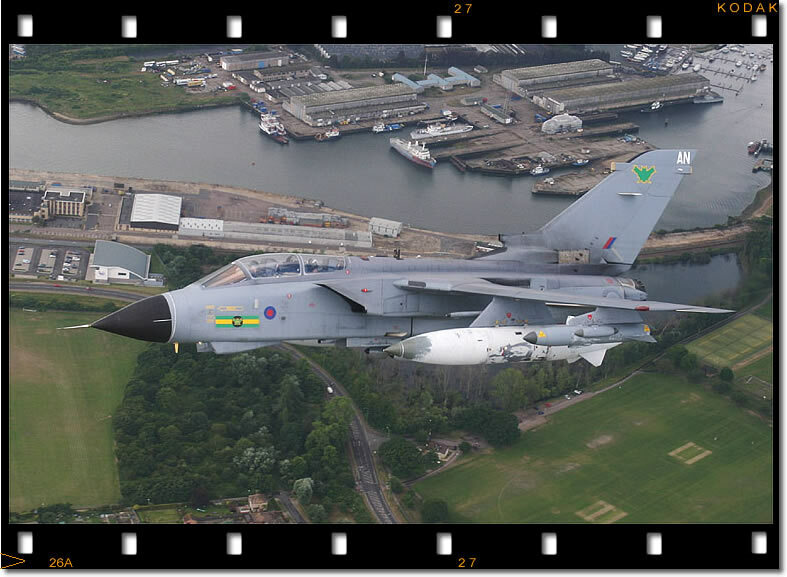 Only ten minutes after passing over the Palace we were touching down at Brize Norton. The families on the flight having had an exclusive opportunity to actually take part in the Queen’s Birthday celebrations and view London at low level. The official birthday of the Sovereign is marked each year by a colourful and historic military parade and march-past, known as Trooping the Colour. The Queen's actual birthday is on 21 April but it is customary for her to take part in the public celebrations during the summer months. The ceremony derives from two old military ceremonies - Trooping the Colour and Mounting The Queen's Guard. The origin of the ceremony goes back to the early eighteenth century, and possibly even earlier, when the guards and sentries for the Royal Palaces and other important buildings in the capital were mounted daily on the parade ground by the Horse Guards building. A feature of guard mounting was for the colours (or flags) of the battalion, which were - and still are - symbols of honour, but also in the past served as rallying points in battle, to be carried (or 'trooped') slowly down the ranks so that they could be seen and recognised by the soldiers. In 1748 it was ordered that this parade would also mark the official birthday of the Sovereign. From the accession of George IV the parade became - with the few exceptions of two World Wars and a parade cancellation in 1955 caused by a national rail strike - an annual event. . The troops participating in the parade are drawn from a military organisation which, though a part of the Army and therefore composed of fully trained, operational troops, is a national institution - the Household Division. It is The Queen's Colour of a Foot Guard battalion which is 'trooped' each year before the Sovereign. Only one colour can be trooped (carried along the ranks) at a time, and the five Regiments - Grenadier, Coldstream, Scots, Irish and Welsh - therefore take their turn year by year. 2004 was the turn of the Grenadier Guards. After the ceremony the Queen joins other members of the Royal Family on the balcony of Buckingham Palace to watch the fly past by the Royal Air Force, whose connection with the ceremony dates back to 1913 when the Royal Flying Corps Military Wing flew at the Royal Birthday Parade on Laffan's Plain, Aldershot. 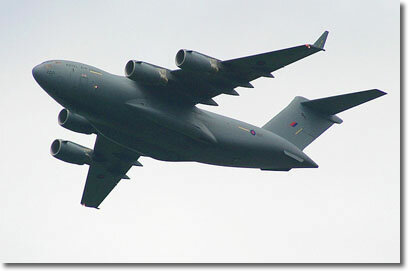 C-17A ZZ171 with the call sign 'WINDSOR LEAD' leads the other elements of the Queen's Birthday Flypast on the final run in to Buckingham Palace. Photographed north of Ipswich at 12:50 by Graham Haynes. 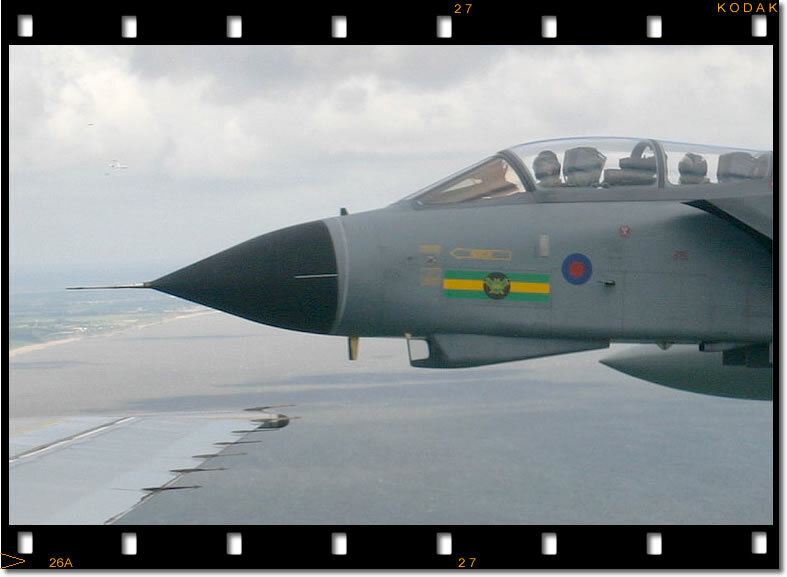 I would like to express my gratitude to Dale Donovan at RAF Strike Command and Sqn Ldr David Rowe, RAF Brize Norton CCO for their assistance in compiling this feature. 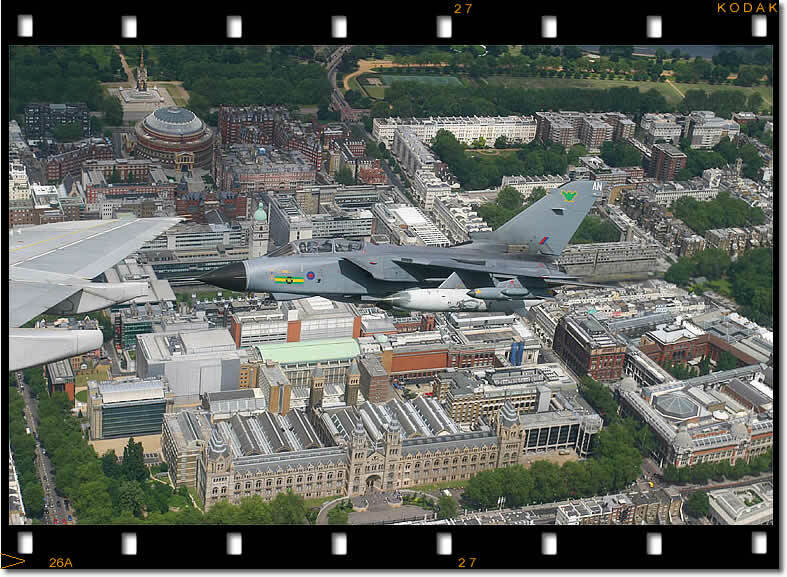 London landmarks - Now over South Kensington, the Tornado GR.4 is nicely framed by the Natural History Museum, with the V&A Museum visible on the bottom right. Above is the unmistakable dome of the Royal Albert Hall and the Albert Memorial above that in Hyde Park.